Who would expect that working in a hospital could be so exhausting and traumatic when all you see are the good things and all you hear are about patients who are getting better while staying in one. For a lot of medical practitioners, working in a hospital is like a dream come true. But just like what is constant in any workplace, employees come and go. Hospital staff or employees resign due to a number of different reasons. They may be personal reasons or work-related reasons. Others would even prefer not explain the reason why. 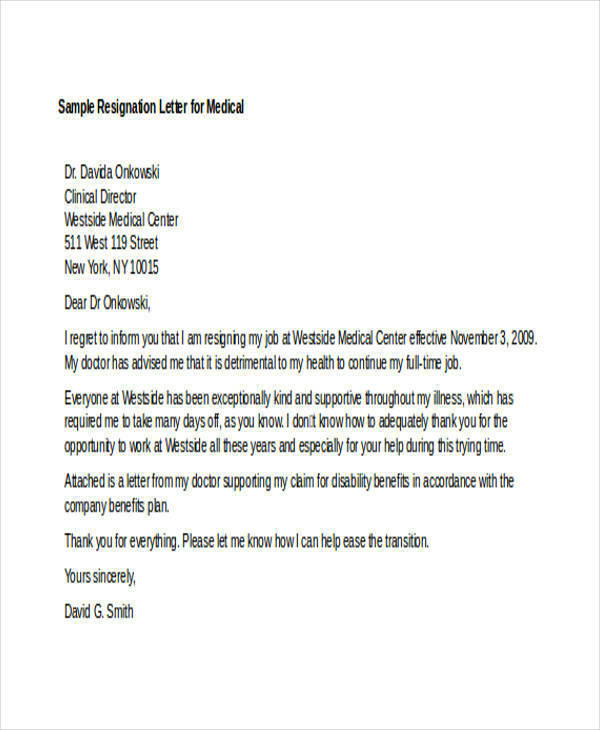 In this article are different resignation letter samples and templates that any hospital staff or employee can use to make their own resignation letter. Included are some useful information and tips for making better and effective resignation letters. Resignation letters are important pieces of document that have been around for a very long time now. It is used in all forms of work and in different industries, regardless of the nature of the job of an employee or staff. There are certain reasons why employers or companies require a resignation letter every time an employee decides to resign from work and these reasons can be better explained with the uses of a resignation letter. 1. A resignation letter is mainly used by employees to formally notify their employers that they are leaving their position as an employee of their company or organization. It is just right and polite to notify one’s employer of any decision to leave the company. 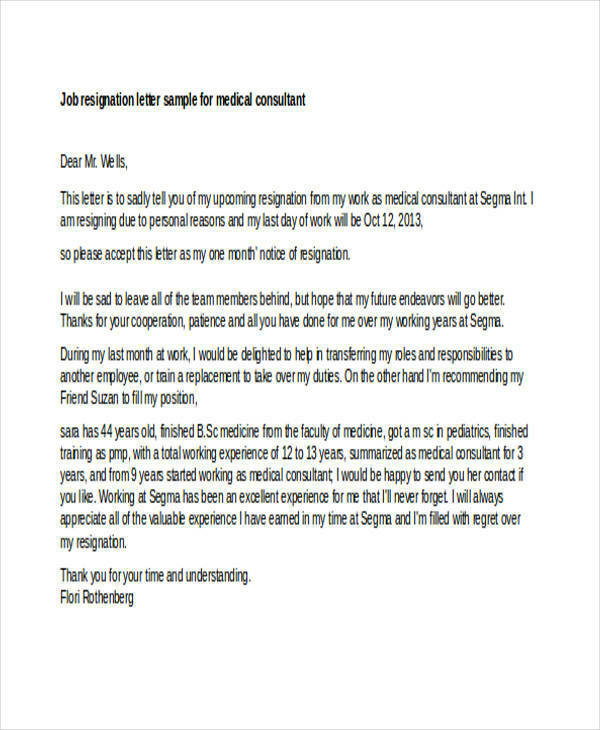 You may also see employee resignation letter. 2. The formal letter is where one’s employer will know the effective date of the employees resignation and as well as the number of days notice they had provided. This notice will give them enough time to find a replacement for the resigning employee or to evaluate what to do with the given situation. 3. It allows the employee to convey their feelings or reasons for resigning without having first to talk personally to their employer. 4. The letter is used as an important document and save in the employees’ file for use as reference for any benefits or last receivables that they are entitled to. 5. Writing a resignation letter stating the reason why one is leaving helps companies evaluate their ways and make a study about how they can do things better, with the management, with production, and other related things. 6. Most employees use a resignation letter to express a word of thanks to their employers for taking them in and giving them the chance to have a worthwhile experience. You may also like sample manager resignation letters. 7. A resignation letter is also used as evidence or proof that the an employee left the company on their own free will and not because of any biases or prejudice at work. There could be more uses of a resignation letter than the ones stated above. 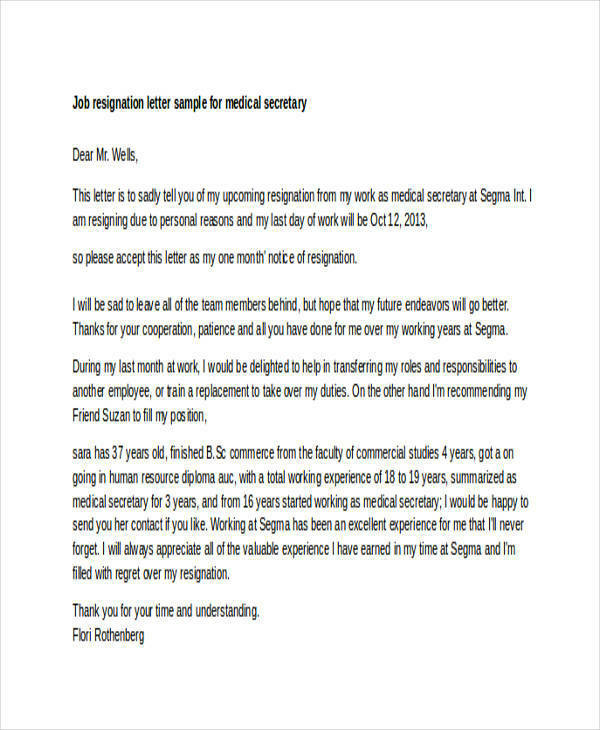 If you are interested to learn more or if you want to browse through different samples and templates, then you may want to visit our website and check different resignation letter samples available. We have standard resignation letter samples and templates, work resignation letter samples and templates, and resignation letter with regret samples and templates, to name a few. What Letter Format Is Used When Writing Resignation Letters? The format used in writing a resignation letter is the same as the format used in writing an application letter. It is important to give emphasis on which format to use in writing different kinds of letters. This has been practiced for decades and is still being used up to this day. It is because writing is an art and regardless of what you write, it should be one that is done with utmost consideration to every detail. A formal letter format is the preferred or the best letter format to use when writing a resignation letter. It follows a certain form and style of writing that looks professional and presentable, as well as has that businesslike but polite feel to it. Although a resignation letter is used to notify an employee’s plan of resigning, it still belongs to the list of business letters used in all working industries. Using a formal letter format sets apart the other letters to those that are essentially important. If you know how to write one type of letter, it surely will be easy for you to write other types of letters. This is because you already know how letters look like and that makes it even easier for you to make one. The different thing that you just have to deal with is the contents of every letter. The following are the things that you should include in your resignation letter. You may also see sample one-day resignation letters. It is optional and may or may not be included on any letter. Contains the employees name, address, and contact details. Refers to the date when the letter will be sent and not the date when the letter was written. The name, designation, address, and contact details of the recipient of the letter is written in this part. It is usually located at the upper left-hand corner of the letter just below the date. 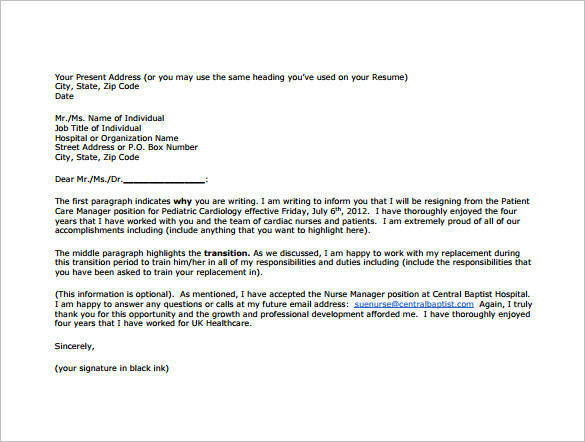 You may also like job resignation letter templates. This formally opens the letter and addresses the person to whom the letter is intended to. The common salutation used in most letters starts with “Dear” and the last name of the recipient. Makes up the biggest part of the letter and consists of three important paragraphs. 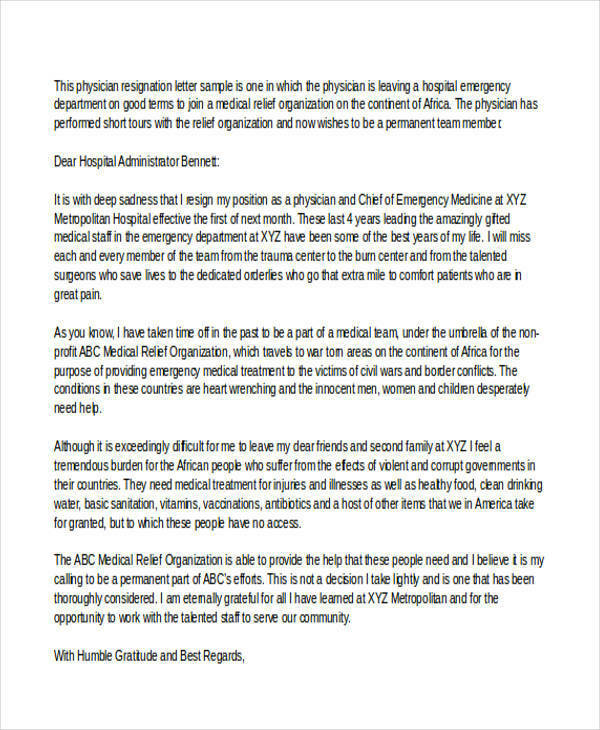 The first paragraph tells in brief what the letter is about and the effective date of resignation. The second paragraph provides an explanation or reason for resignation. The third paragraph is for conveying one’s thanks as well as offering help for making the transition go smoothly. You may also check out temporary resignation letter samples. The commonly used greeting to close a letter are “Respectfully yours” and “Sincerely yours.” This signifies the end of the letter. Found directly below the closing, this is where the writer writes their full name and position in the company. On top of it is where the writer affixes their signature. It is easy to get hold of any type of resignation letter, especially with the use of the Internet and online search engines. Just by looking at it we immediately recognize that it is some form of a letter even before reading the details. This is because we already know what the parts of a letter is. Learn more about letters with the use of samples and templates, like sample business introduction letters, sample professional cover letters, and recommendation thank-you letter. Who Do You Write a Resignation Letter To? Companies have their own set of standard operating procedures or protocols that every employee should follow and that includes who the resignation letter should be addressed to. Some company guidelines require that an employee’s resignation letter be submitted to their immediate supervisors and then to the manager before it is endorsed to the human resources department. Other companies prefer to have resignation letters submitted directly to the human resources department or addressed to the owner or CEO of the company. To know who to write a resignation letter to, you may check your company’s employee handbook. This is the one place where you can find work-related and company-specific information that you need. Can You Email Your Resignation Letter? It is always polite and proper to have one’s resignation letter submitted in person. This has been a practice that still exists even when technology has made so much advancement. Although that is the case, many things have come to adopt to change and that includes how resignation letters should be submitted. Submitting a resignation letter in person is still the preferred way of doing things, but that doesn’t mean that it is the only way to do it. Employees can have their resignation letters emailed to their employers only if it is the resignation policy or procedure that is required by their company or employer. If you are unsure about what to do, ask or consult your company’s employee manual. You may also see sample rude resignation letters. 1. Going with the wrong reason for resigning. If you are not yet sure about the thought of resigning, then think about it one more time rather than writing any random reason that you can think of just to have something to write. You will probably produce a poorly made resignation letter, which is always not a good thing. 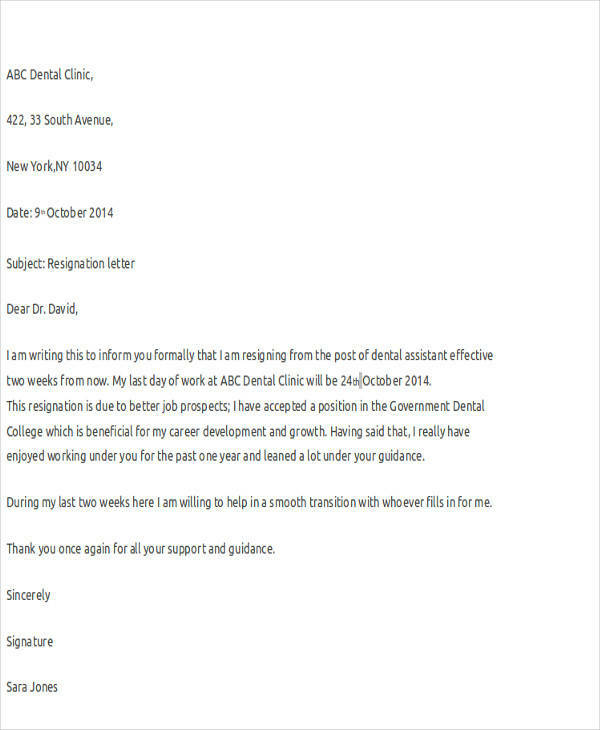 You may also see sample membership resignation letters. 2. Conveying negative emotions to one’s employer. Never give a hint or the feeling that you have some resentment toward your employer. It is never polite to do so and will only make you feel uncomfortable in the presence of your employer. 3. Making criticisms about the company, the management, and one’s colleagues. You can rant all you want when you are alone or in your imagination but never on your resignation letter. Criticizing everything that you did not like with your work will not do you any good, but it will only create a bad impression of you. 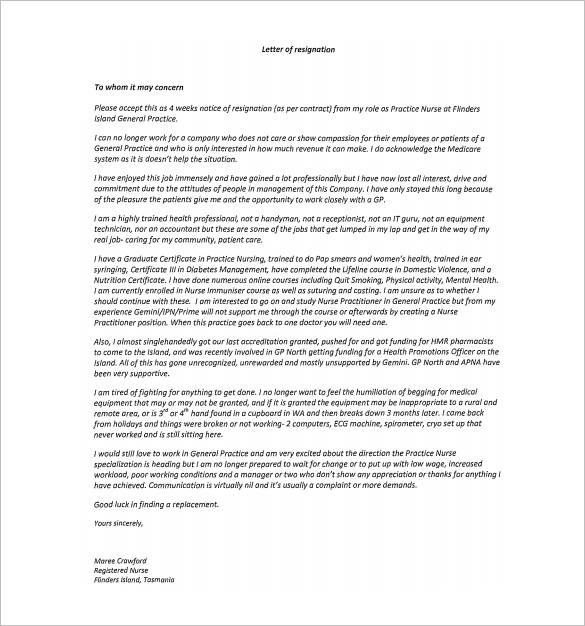 You may also like sample childcare resignation letters. 4. Over exaggeration in writing. Tendency is when you just make up reasons for resigning, you end up over exaggerating things, which is again a bad thing. 5. Telling about the new job that you got. It is best to avoid writing about your new job in your resignation letter. Although your employer wold have wanted you to stay, they will not find it interesting to read about how you feel about your new job and employer. And seriously, don’t you just find it so rude to do that? 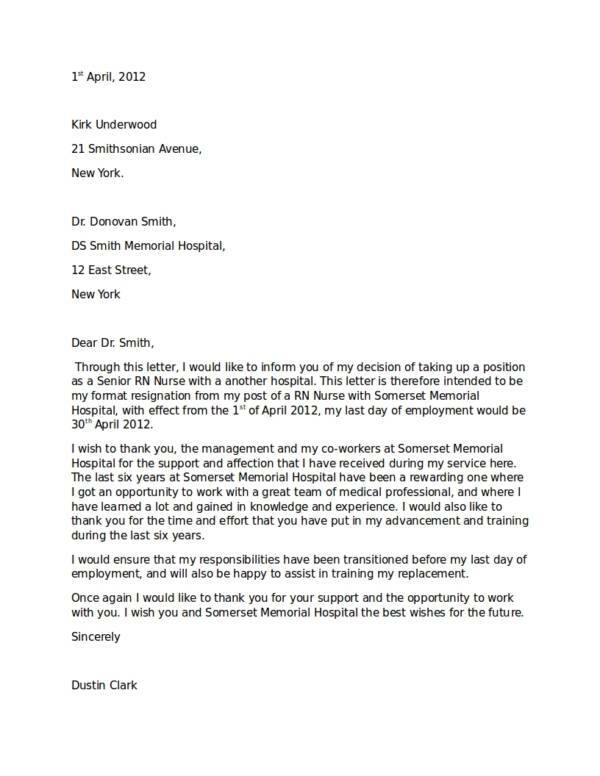 You may also check out sample informal resignation letters. 6. Requesting to get updated about future employment. It was your personal decision to leave, so why would yo request to be contacted for any employment opportunities from the same employer? That just doesn’t seem right and your employer would probably not want to get you if you just resign randomly. You might be interested in sample company resignation letters. 7. Refusing to assist new employees for one’s replacement. No matter how bitter you feel toward your employer or company, it is still your duty to train or teach the new employee who is going to replace you. 8. Complaints that are immature. You should know when your complaints are logical and mature. It’s such a big turn-off and an annoyance if you make immature complaints that really don’t matter or do not make any sense for the company. When you write your resignation letter, make sure that you avoid doing these mistakes. If you are clouded by your emotions then you need to calm down before you write anything that could ruin your relationship with your employer. Know more about different resignation letters by checking out related topics, like Things You Need to Remember When Writing a Resignation Letter, Retirement Resignation Letter Samples and Templates, and Professional Resignation Letter Samples and Templates, to name a few. How can you make your resignation letter better and more effective? Here are some tips that will help you have that done. 1. Always be polite when writing your resignation letter. There is nothing you can gain from being rude and sounding condescending. 2. Maintain a good relationship with your employer even when you are about to leave. Who knows, you may need their help in the future. Doing so is still to your advantage. 3. Write clearly and concisely so that your employer will not misunderstand the reason why you are leaving. Using difficult words may just get you in trouble. Besides, what’s the point of impressing your employer when you are about to leave in the first place? You may also see resignation letters no notice. 4. Follow the appropriate letter format for your resignation letter as well as your employer’s preferred way of writing it. 5. Include in your letter a message to convey your thanks to your employer for the chance of letting you work with them. It makes you sound professional and it is way better than ranting about random things that the company clearly does not care about. 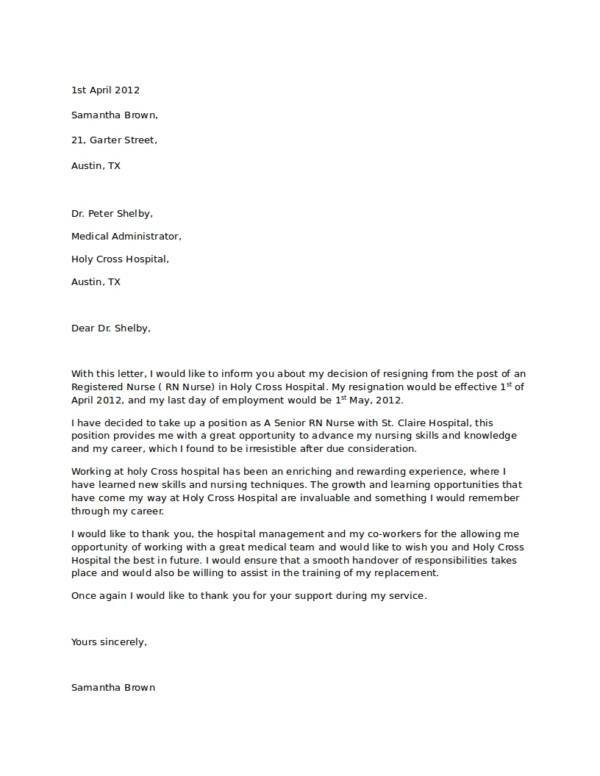 You may also like sample resignation letter for family reasons. 6. Offer your help during the transition to to make the process as smooth as possible. 7. Always be sincere with everything that you write. Following the tips above will surely help you make that resignation letter you are writing or are planning on writing better and effective. 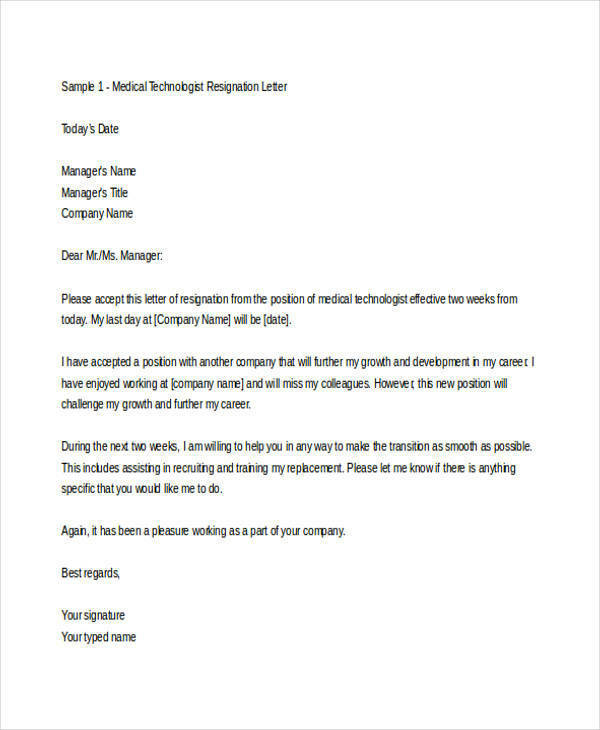 If you need more information or want more samples and templates about resignation letters, you can check them out on our website. We have their a variety of topics that you can choose from, like pregnancy resignation letter, formal resignation letter samples, and board resignation letters.